Though socio-economics are a factor, that's not the predominant issues, probably because many teens favor free apps. "Eight in ten (79%) teen mobile device owners living in households earning $50,000 or more per year download apps, compared with 60% of those living in households earning less than $50,000 per year. Teen app downloading does not vary significantly according to a parent’s education level or by their race or ethnicity," according to the report. Girls who responded to the survey were more aware than boys of the risks associated with location tracking services in many mobile apps -- 59 percent responded that they turn off location services, while only 37 percent of boys reported turning off the service. 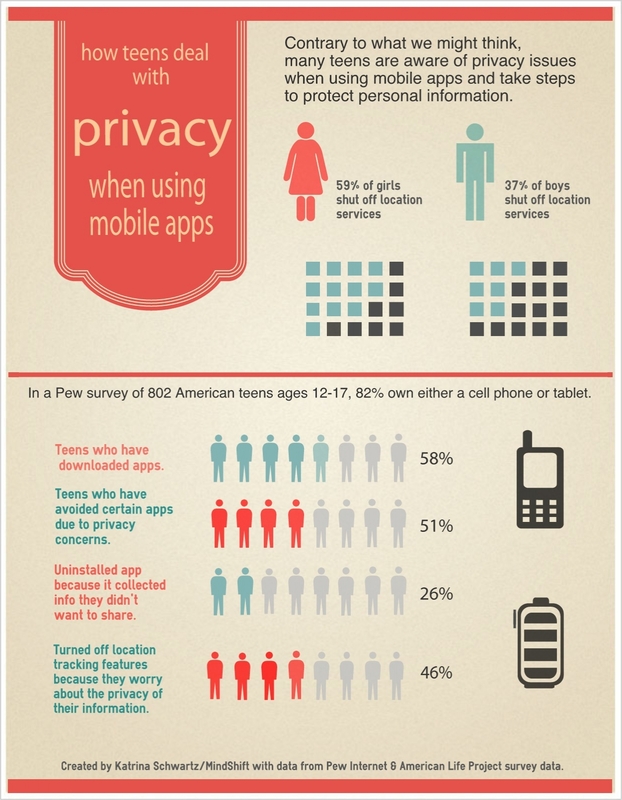 Seeking outside advice about how to manage privacy settings is a big indicator of whether a teen is taking steps to protect his or her privacy; 70 percent of teens have sought privacy advice from an adult or outside source. Of those "advice-seekers" who have mobile devices, 50 percent turned off location tracking features, as compared to 37 percent of teens who did not seek advice on privacy. The infographic created by MindShift illustrates some of the highlights from the Pew survey.